In my favorite Google Image search result for “Deborah Cowen,” she is posed against scaffolding. The picture, like Cowen, is funny, and to the point: she is, after all, a scholar of logistics and infrastructure. For weeks, Cowen and I tried to schedule a time slot, some joke about late capitalist franticness and overwork whose punch line was corny but binding. Missed you. Again. Ha, ha. Cowen asked for my questions in advance, and spoke in pages of fully formed, well-linked paragraphs; she could have been freestyling JSTOR abstracts. During our phone call, Cowen often apologized for getting so enthusiastic about “boring” topics like the shipping container. But her analysis of logistics and its relationships to the criminalization of protest and labor strikes, the shift to national security as protection of trade flows instead of the protection of people, and the corporate appropriation of military techniques have wide-ranging and very non-boring effects for surveillance studies, immigrants, and anyone following the infrastructural conflicts around #NODAPL and the water pipes in Flint, MI. 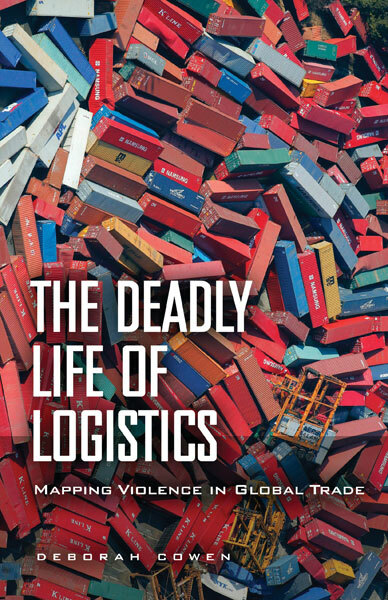 Cowen’s most recent book is The Deadly Life of Logistics: Mapping Violence in Global Trade (2014). We spoke over the phone immediately after she wrapped up an eight hundred-person lecture on Octavia Butler and utopian infrastructure, and continued our discussion over email. What are logistics, and how did they change post-WWII? Logistics organize the world of war and trade. They calculate, plan and manage movement and circulation. They aim to efficiently get people and things where they need to go. Often those people and things are military in nature, but it is the corporate face of logistics – the world of Amazon, Walmart and Ikea – that is most familiar to many today. Logistics, as we now know the field didn’t exist before WWII. Until that time, logistics was strictly something militaries did. Logistics was first conceived through war, and would eventually underpin empires. It was one of the modern “arts of war” along with the much sexier arts of strategy and tactics. 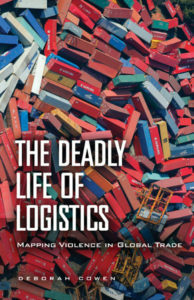 The field of logistics is often understood to be highly technical, even technocratic, yet it has long been at the center of organized violence. Fred Moten and Stefano Harney (2013) suggest, for instance, that the first large scale modern experiment with logistics was the trans-Atlantic slave trade. The “revolution in logistics” that took shape in the wake of WWII gave birth to a corporate science of logistics. This was the product of a state led effort to have corporations learn from military methods. Robert McNamara founded an organization called The Logistics Management Institute to facilitate just that. Half a century later, the LMI continues to play a lead behind-the-scenes role in making war and trade more efficient and profitable. The “revolution in logistics” was thus not a civilianization of the field, but the enmeshing of the military and corporate worlds through the science of circulation. But the “revolution in logistics” was also a profound rethinking of production and distribution. Previously, the standard model of the corporation emphasized production, which was understood to take place in a factory. Distribution, which was almost synonymous with transportation—was understood really just as a matter of getting stuff from the factory to the customer. The revolution in logistics and the birth of a management science of supply chains suggested that distribution and production could no longer be separated. Since 1960s we have seen the rise of a whole other way of calculating value that was no longer looking only to production in the factory. Rather, through the introduction of systems thinking, these early experiments with logistics management approached business as a system of physical circulation. The introduction of systems thinking meant that all the costs of the physical movement of stuff, both in production and afterwards were calculated together. Management shifted away from a focus on minimizing transportation costs, to think about how value could be maximized by reorganizing “materials movement” across the entire system of production and distribution. And part of what they found was actually that very counter-intuitive moves would be very lucrative. So you could move production facilities further from market if you had the right kinds of labor at the sites of production but also the right infrastructures of circulation, including everything from warehousing to transport all along the supply chain to get the commodity to market. Calculation was key, but technology was also crucial. You have the development of a technology like the shipping container that, once it became a standard in the US military campaigns, increasingly became the global standard of distribution. A container allows for dramatic reduction in both the time and the cost of circulating things by virtue of the fact that you can move a container from one mode of transportation to the other, from ship to rail or truck, without having to pack and re-pack the contents. And this cuts labor time and costs from the whole circulatory system. In a military context, this focus on systems through logistics has reduced the time involved in getting both troops and munitions to the battlefield from months to weeks. So containerization and then also the computer become really crucial—none of this could have happened without the computer, because the kinds of calculations that go into logistics management decisions require enormous data sets bring together a whole range of different conditions and possibilities. How has the kind of globalized trade enabled by logistics affected conceptions of borders and nation-states? One of the strangest moments in my early research that has stuck with me ever since was this moment after 2001, in the post-9/11 context, where I was meeting with security officials who were trying to sort out what was framed at the time as a profound contradiction of the border. This was, on the one hand, that the border needed to be tightened or thickened to reinforce “national security,” and that, on the other hand, the border was a profound problem for global trade – which was itself increasingly understood as essential to “national security”. So, in that context, a dilemma was posed, and it went something like this: “national security has become a threat to national security.” This seems nonsensical, but I started to understand why the problem was phrased that way when I considered the different ways in which security was being understood and described. That claim can be understood better if we rephrase it as, “National security—understood as a project of territorial security that involves protecting a sovereign state bounded by a border—that form of security has become a threat to another, increasingly critical conception of national security, which enshrined global trade at its core.” So you start to look at the ways that a number of states—especially global north states like the United States, UK, Canada—were re-writing their national security strategies around this time—almost all of them had global trade at the center, as one of the central three or four principles. And the experiment was, “How can we both border and keep flows moving?” How do we protect not the national border, but the global circulations of trade? And there’s been a proliferation of new policy that turns ports and other kinds of border crossings to—no longer like lines, vectors or walls—but to exceptional zones where flow and circulation are as important as bordering and containment. I spent a lot of time looking at how port spaces have become almost exceptional spaces, where labor is managed in increasingly securitized ways with biometric technologies and even more stringent immigration checks. This remaking of border management into a zone that aims to be both open and closed – that aims to facilitate trade, but control or contain so-called “undersirable flows” (usually migrants) – is one piece of the rise of a whole new paradigm of security – supply chain security. Supply chain security aims to protect infrastructures and systems of circulation, and thus follows the “pipelines” of trade across and deep within national borders. Crucial here is the US Global Supply Chain Security Strategy as one key piece in a whole plethora of programs, missions, policies and regulations enacted at multiple scales by public and private bodies to protect circulatory systems. Supply chain security has profound implications for citizenship and the geographies of security. If the imperatives of logistics are to keep these supply chains circulating, and if you think we have a model of security that’s trying to protect that form of circulation, then disrupting supply chains can very quickly become a matter of national security. When a particular group of people tries to disrupt the supply chain deliberately—whether that’s through protest, labor communities, activist groups, Indigenous nations, blockading rail lines and highways—those groups can very quickly become labeled as “terrorists,” thereby sanctioning an aggressive, even military, response. The other side of supply chain security that I’ll highlight is the kind of astonishing range of forms of disruption that get treated by this common security paradigm. So you have things like volcanic eruptions, nuclear disasters, labor actions, so-called “pirate attacks,” anti-colonial activism, even traffic jams, treated as having something in common, and governed with a common form of security. And, of course, a volcanic eruption has a very different set of logics than a labor action in the context of a port, for example, but they’ve all become governed under this rubric of supply chain security. At the same time, while supply chain security has a very recent history of really just the last decade or so, this kind of linear cartography of jurisdiction and protection – the practice of securing particular trade routes has a long history in earlier periods of colonial settlement and maritime imperialism. In many ways, what we’re seeing now is a very modern version of old imperial forms of security and legal jurisdiction. In the chapters on supply chain security, I was also struck by what you call “preemptive threats,” in which states, militaries, and police give themselves permission to enact forms of violence or control, not based on what a person or a group has done, but on what they “could” do. It’s a total disregard of due process, “guilty before being proved innocent” instead of the reverse. This isn’t new for everyone—it’s the kind of “law” that, for example, black people in the US have always had to operate under—but it was interesting to see how this logic was reshaping borders as well. For example, you talk about the shift from screening “dangerous packages” at US Customs centers to preventing those packages from even being sent out in the first place, which moves the border to whatever place that screening process is now happening. Absolutely, there’s a movement toward the kind of border activity that still takes place where the supply chain starts. But the other important implication of pre-emption is the increasing reliance on corporations to conduct their own security. So, part of the logic is that it’s impossible to screen the volume of trade that’s moving into the US at any one moment. If we tried, the economy as we have it now would literally stop. And, in the immediate post-9/11 period, there was a lot of debate around this, because some people thought that the only way to insure supply chain security would be to actually do this kind of screening, which would inevitably require a return to more national forms of economy and more domestic or local forms of production. But the supply chain school of thought that won out suspended the idea that you could know everything, and, instead, argued for risk analysis—targeted inspections, not just of shipments, but of smaller shippers as well. By design, it privileges large corporations, and because of this reliance on risk management and pre-emption, we have corporations serving really as the infrastructure of supply chain security. How can we use logistics to understand the information economy? I recently came across references to the supply chain as the physical Internet, which I found really fascinating, in part, because the Internet has become a metaphor for supply chains, which is fascinating given the fact that they’re kind of inseparable, and that what’s being called upon in terms of our imaginaries of that digital world is precisely the kind of physical interconnections that the logistics revolution has underpinned. There’s no doubt that the digital and more physical kinds of infrastructure that underpin the world of supply chain management and logistics are so entangled that you really cannot separate them. And I think one of my favorite pieces of dealing with this is one by the wonderful scholar Anja Kangiesser who has looked at the ways that the kind of digital tracking and tracing of workers in the supply chain has come to be absolutely central to the ways that supply chain management works. And in that sense, the control of efficiency and the circulatory of the system more broadly becomes completely dependent on this kind of surveillance. Historically, we can see that some of the technologies that were used to first trace packages in the supply chain world to underpin the increasingly “just-in-time” production system have been more and more used to track people, and the whole rise of biometric identity cards in managing laborers is one really clear indication of that. This also plays out in the consumer service realm when, for example, we want to track our packages, when our Uber driver is going to arrive, and the way that we visualize or see that is through this kind of digital surveillance of workers. In the work I was doing with port workers, we saw that the level of security and surveillance was really aggressive in the sense that people’s sexual partners were being monitored, and certainly immigration histories, questions around people’s kind of criminal past that, would have never passed muster under old labor laws. The ways surveillance technologies are tested and then naturalized as consumer products reminds me of social media platforms addicting us to producing data that then allows us to be tracked. Final question, and perhaps a predictable one, but I was wondering if you could talk about what you’re working on right now. 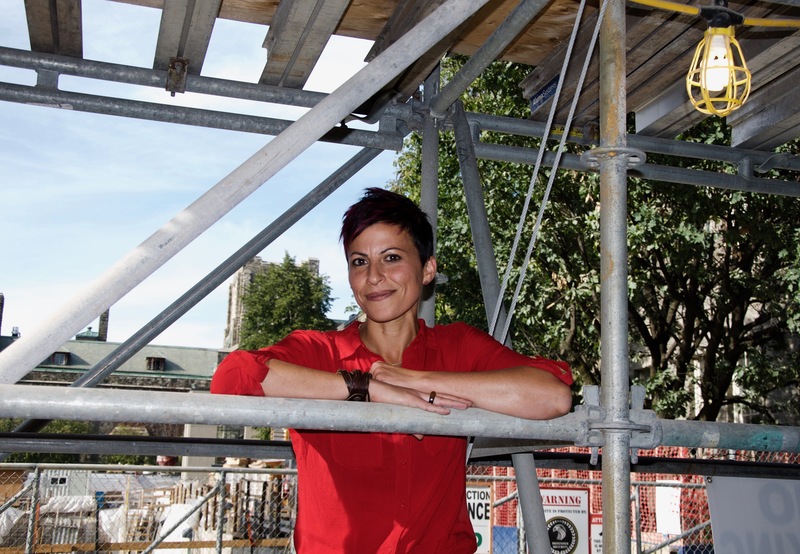 I’m embarking on a project on infrastructure politics and questions of citizenship. I’m really interested in the tensions between the technocratic, securitized and financialized management of infrastructure on the one hand, and the increasing politicization of infrastructure by social movements on the other. We can see this certainly in major struggles like Standing Rock or Flint, MI. Infrastructures have enabled atrocious violence historically and continue to do so in the present, but they are also critical to sustained opposition and transformation. I am interested in the ways that movements seeking to contest or transform infrastructure are offering us some of the most creative and effective models of being political, and of possibilities for different futures. Haley Markbreiter’s work is in or forthcoming in The New Inquiry, Mask Mag, and the Chicago Review. You can find them on Twitter at @dotmovfile and on Instagram as @frogenyozurt.